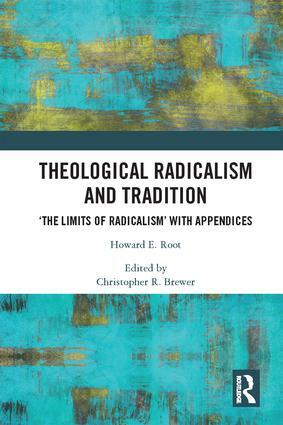 Theological Radicalism and Tradition: ‘The Limits of Radicalism’ with Appendices. By Howard E. Root. Edited by Christopher R. Brewer. Pp. xii + 165. Illustrated. Abingdon: Routledge, 2018. The prominence of Howard E. Root (1926-2007) during his career is not matched by his obscurity in subsequent years. Born in the USA, he moved to the UK in 1949 after a time teaching in Egypt, and studied and taught theology and philosophy at the universities of Cambridge and Oxford before taking the chair of theology at the University of Southampton in 1966. As Christopher R. Brewer shows in his helpful introduction to this welcome volume, Root was thought to have great potential from early on in Oxford, and this repute soon spread around the Church of England. Root was appointed one of the Anglican observers at the Second Vatican Council when not yet 40, and he was subsequently called upon to serve the church of which he was a priest on successive commissions, not least that on marriage and divorce which reported in 1971, and the Anglican-Roman Catholic International Commission. But Root published relatively little, even for a time before the hyperactive publishing culture of the modern university, and as a result he figures hardly at all in the current literature on the period. If his writing has been noted at all, it was for his essay that opened the 1962 volume of ‘essays concerning human understanding’ edited by Alec Vidler with the title Soundings. Root’s essay, entitled ‘Beginning all over again’, surveyed the current state and future prospects for natural theology, and was robustly dealt with in E.L.Mascall’s book-length response to Soundings, published as Up and Down in Adria (1963). While Brewer suggests (rightly) that Mascall somewhat missed the point that Root was making, his accusation that Root was proposing a wholesale abandonment of Christian tradition has to a certain extent stuck, and Soundings as a whole has been read as the catalyst to much of the ‘radical’ theology of the next decade. But, as Brewer points out, ‘Mascall did not, and should not, have the last word on Root.’ (p.14) This edition of Root’s hitherto unpublished Bampton Lectures for 1972 should go a long way to recovering the range and intentions of Root’s thought. It will be read with interest both by theologians and by historians of theology and of the religious climate of the sixties and seventies; no serious library for theology or religious history should be without it. The eight lectures of ‘The Limits of Radicalism’, though brief in compass, are rich and suggestive, with scarcely a dull sentence. The subject is nothing less than the proper purpose of theology as a discipline, and the degree to which it, and natural theology in particular, could hope to survive in the peculiar intellectual conditions of the time. Though no theologian himself, this reviewer would imagine that Root will now find new conversation partners amongst contemporary theologians. Brewer shows in particular the synergies and continuities between Root and the work of David Brown, under whose supervision Brewer completed his graduate study at St Andrews University. Brown is, Brewer suggests, ‘in more ways than one… Root’s theological heir’ (p.20). But it is the significance of Root’s lectures in their historical context that I wish to explore in particular here. Root was invited to give the Bampton lectures in early 1970, during what in retrospect can be seen as a hiatus between phases in the theological confrontation between radical and conservative. The initial excitement caused by Soundings and then Honest to God (1963), and Harvey Cox’s The Secular City (1965) had to an extent died down, and the controversies over the report Christian Believing and the work of John Hick (The Myth of God Incarnate, 1977), Maurice Wiles and Dennis Nineham were yet to come. And so there was some space for a stocktaking, such as in Michael Ramsey’s God, Christ and the World (1969), of which Root’s lectures were arguably a part. At the remove of a few short years, Root’s criticisms of the radical project of the preceding decade were acute. Born of a failure of nerve – a loss of confidence in the tools for theological study – the movement to ‘translate’ the message into new terms had risked the disintegration of the discipline into a set of sub-departments of history, literary criticism and other disciplines. But this left theology with nothing distinctive to do, no peculiar concerns to call its own, and for Root it was metaphysics that had been left out; in the final analysis, theology without metaphysics was largely redundant (Lectures 1 and 2). Root was particularly alive to the significance of terminology – to the power of particular discourses, as we might now say – and there are subtle and stimulating asides, such as on the curious process by which ‘radical’ – in its etymology a restorative, backward-looking term – had become exclusively focussed on the future (Lecture 3). Similarly telling is a brief note on the idea of the need for the church to offload its ‘baggage’, a widely used and largely unexamined metaphor in the period. Root was also a prolific maker of fertile images, most particularly in his discussion of the nature of tradition (Lecture 4), which may be the part of the lectures that has the most enduring significance. It was not necessary for the church to choose between two mutually incompatible notions of tradition: on the one hand, a petrified set of texts, doctrines and symbols that could only be preserved and passed on unchanged, and on the other, tradition as a deadweight from under which the church needed to pull itself (the attitude which Mascall thought he detected in Root in 1962). For Root, tradition is in a continuous process of being received, as Christians select those elements that are of most pressing usefulness, and in the process modify and renew them in readiness for a transmission in turn to the next generation. But this process of transmission was not linear; to look for genealogies of tradition was to misconceive its nature. Root proposes the image of multiple constellations of theological effort, an image ‘that preserves a sense of order, but at the same time not only permits diversity, but finds diversity an element in its order’ (p.67). While there may be disagreement over particular points of doctrine (individual stars in the constellation), the constellations are so interconnected such as to constitute an identifiable whole, a recognisably Christian theological universe. The suppleness of this notion of tradition was rare indeed in the theology of 1972; one wonders what Mascall would have made of it. One also wonders how the subsequent development of Anglican theology might have been different had this ‘third way’ been available. A second major theme is connected to that of tradition: the responsibility of the Christian theologian to that tradition and to the church that receives it. The controversy over John A.T. Robinson’s Honest to God had brought into sharp relief the tension between freedom of enquiry and the responsibility of the theologian to his or her church, as had the leaving of the Roman Catholic church in 1966 by Charles Davis; an episode that Root addresses directly. Root’s notion of tradition led him to conclude that Davis, by renouncing any claim that his church might make on his work, could no longer meaningfully be called a Christian theologian, though a theologian he remained. Root adopted an analogy from the arts, from the process by which a work of art comes into being. As a painter is commissioned to fill a certain space with a work on a certain subject, so the theologian is commissioned by his church, with the constraints that that entails; the choice of materials, and the use he makes of those materials remains his prerogative, as does the opportunity to convey something of his own individual, unique sense of the message itself. At a time when the Church of England was reorganising (and reducing) its provision of theological education, and the nature of the discipline was changing in the universities, Root’s comments were timely. The church could have only limited use for the ‘freelance men’ in the universities who responded to no commission in particular. Finally, Root’s set of lectures is remarkable for the use he makes of the arts, both as a source of the analogy explored above, and as a remedy for the ‘imaginative impoverishment’ of theology that he had identified in Soundings. The Church of England had begun in the previous two decades begun to rediscover a tradition of artistic patronage, led in large part by Walter Hussey, but this was not yet accompanied by the kind of theological engagement with the arts that characterises the work of David Brown and others in more recent years. Root, a great lover of music, makes great use of artistic metaphor as a means of understanding theology, drawing on T.S. Eliot, W.H. Auden and Pierre Boulez. But he also wants to prompt theologians to look to the arts as generators of new images that reflect the experience of life in the early 1970s. Not all these images would be immediately useful to all – they were, after all, only individual stars in one of Root’s constellations – but over time these images would cluster together, be found in theological dialogue with each other, and either become part of the tradition, or (although Root does not spell the point out) be found to be useless and fall away. In this, in the context of the theology of the time, Root was advanced indeed, and foreshadows much of the more recent work on theology with and through the arts. Readers of this volume will have reason to be grateful to Brewer for his scrupulous annotations to the text, few of which Root himself had supplied. Some of them are perhaps over-long, such as the long lists of reviews of volumes to which Root had contributed (p.29), but this reader (at least) would rather this inclusive policy than its opposite. The appendices – other essays from Root that were either obscurely published or not at all – do much to complement the main text, though the selection of correspondence relating to the non-publication of the lectures adds little and could have made way for something more substantial in what is a slim and expensive volume. These cavils aside, Christopher Brewer is to be commended for this valuable edition, which will go a long way towards the recovery of Root for which it is intended.